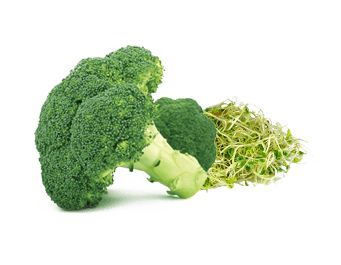 Broccoli (Brassica oleracea) is an edible green plant belonging to the cabbage family. This cruciferous vegetable is very low in fat, high in fiber, provides a good amount of protein and is packed with immune boosting phytochemicals that include glucobrassicin, the carotenoids lutein, zeaxanthin and beta-carotene, and the flavonoid kaempferol. Its high beta-carotene content and high levels of folate and calcium help promote healthy cell and tissue growth. Broccoli is a good source of potassium and vitamin C, A and pyridoxine. Broccoli also contains glucoraphanin (the precursor to sulforaphane) and Indole-3-carbinol, two plant compounds known for their antioxidant and anti-inflammatory properties, immune system support and other potential health benefits. In addition, Broccoli is high in soluble fiber which binds cholesterol and bile acids for excretion from the body, promotes satiety and slows the emptying of the stomach which prevents spikes in blood glucose levels.